MANILA, Philippines — The Philippines is the “only non-outperforming economy” in the region, McKinsey Global Institute said in its latest report, which noted that the country has the potential to stand out should it maintain its accelerated growth pace. Meanwhile, there were 11 “recent outperformers,” or countries that reached real average annual per capita GDP growth of at least 5 percent over the 20 years between 1995 and 2016. 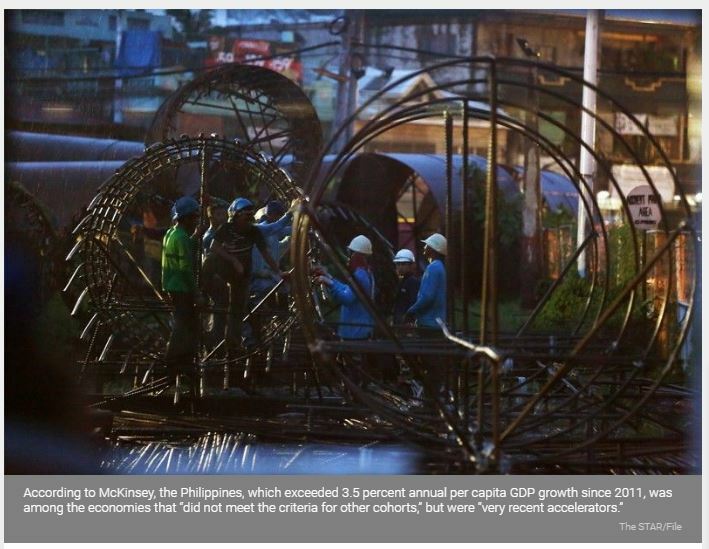 McKinsey, a business and economics research consultant, expects the Philippine economy to grow 5.3 percent and achieve a per capita GDP growth rate of 3.9 percent from 2015 to 2030. “The region’s only non-outperforming economy, the Philippines, has grown very strongly recently and could potentially break through into the ranks of outperformers if it maintains its trajectory,” McKinsey said. “Laying strong policy foundations and fostering the growth of large firms could elevate these and other countries to the ranks of future outperformers,” it added. The Philippine economy has enjoyed uninterrupted growth for the past quarters, thanks to benign inflation in the previous years that had given the central bank enough room to keep interest rates low. The Duterte government plans to ramp up infrastructure spending to 7.3 percent of the country’s gross domestic product by the end of Duterte’s six-year term, and supercharge economic growth to 7-8 percent from this year up to 2022. But in the second quarter of 2018, the Philippine economy sharply eased to 6 percent, its slowest pace in three years. In the first half of the year, the economy grew at 6.3 percent, below the government’s goal for 2018. Some analysts expect economic growth to continue to slow down over the second semester of the year as tighter monetary policy and higher inflation weigh on consumer spending, which accounts for about seven-tenths of the Philippine economy.